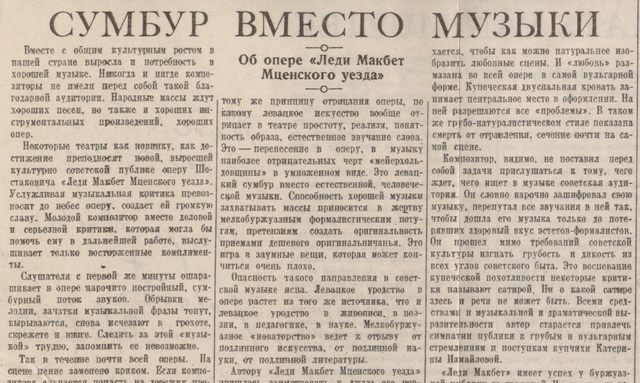 Russian Classical Music: Dmitri Shostakovich: "Muddle instead of Music"
Dmitri Shostakovich: "Muddle instead of Music"
"Muddle instead of Music" is the headline of this editorial in the Pravda, the official Communist Party Newspaper. Two days before, Stalin, who had recently taken an interest in Soviet opera, had walked out on a performance of Dmitri Shostakovich's opera, Lady Macbeth of the Mtsensk District. The articles author was anonymous, but some speculate that it was Stalin himself lamenting the "deliberately dissonant, muddled stream of sounds" in Lady Macbeth. The plot of the opera involves a Russian housewife in the 1800s, who falls in love outside of her marriage and is driven to murder. This story, coupled with the "dissonant" music, inspired Stalin to condemn the opera as amoral and obscene. This paved the way for more intense Communist censorship of Soviet artists. That Shostakovich was at the center of these events in 1936 is not unreasonable. Like Prokofiev, Shostakovich was a child prodigy, and also enrolled in the St. Petersburg Conservatory at the age of 13. Shostakovich was a little younger than Prokofiev, born in 1906 in St. Petersburg, but he also earned a reputation in the conservatory as an enfant terrible. But except for Soviet censorship, the similarities stop there. 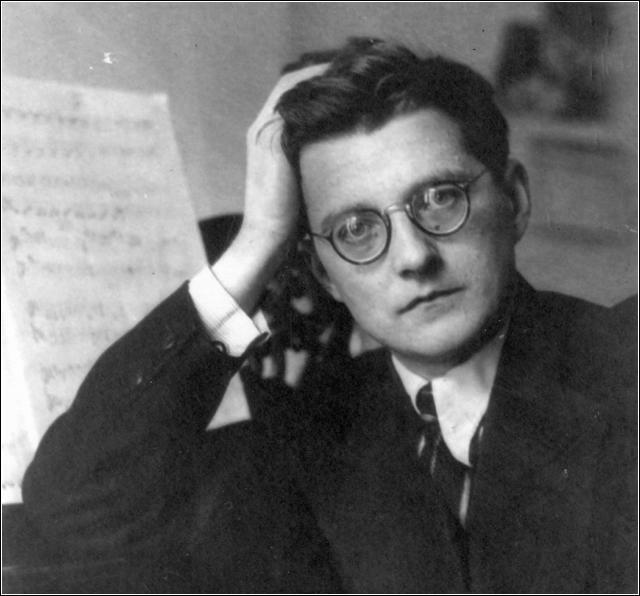 Shostakovich was a deeply complex man, who could be profoundly emotional, sometimes dry and cold, and especially darkly sardonic. And after the above article appeared in the Pravda, he was a man continually haunted by a pall of fear. The fear of political retribution Stalin had cast over the entire nation. Shostakovich was not politically naive, and his musical career started off with great success, despite the music's radical nature. The composer was prone to the grotesque and the avant-garde during these years, and beginning in 1929 he formed a relationship with film makers Grigori Kozintsev and Leonid Trauberg. In their silent film New Babylon, Shostakovich makes a habit of presenting the viewer with extreme musical juxtapositions to the action on screen. The video example here shows the French Army shooting the members of the Paris Commune. The music is a parody of Offenbach's jaunty can-can. The juxtaposition undoubtedly makes a strong statement. It was in this fashion that Shostakovich wrote his first opera The Nose. The opera is, in fact, about a nose, and this nose is one that detaches itself from its owner and lives a life of its own. An upper class life I might add. The music is still ironic, and dissonant, in a way that the composer claimed mocked bourgeois values. But it seems that Shostakovich was fooling himself, for he was soon after accused of "formalism." A few years later the same thing happened with Lady Macbeth of the Mtsensk District. But this time the scope was greater. When the Pravda article came out, Shostakovich was working on his Fourth Symphony. The composer realized this work would too be slapped with the formalist label, and decided to not have it performed. Instead he continued on to his Fifth Symphony, one in a "democratic" style. That is, a style well suited to the common man. The symphony was a success, and earned Shostakovich the good graces of the authorities once again. The Pravda even publicly praised Shostakovich for "not having given into the seductive temptations of his previous 'erroneous' ways". After this redemption of sorts, the composer decided to 'lay low' and work mainly on film music, a favorite of Stalin's. But as the Second World War came around, Soviet artists were given more freedoms, and a more pertinent role in society. If Russia was winning, Stalin wanted a heroic symphony. If they were losing, Stalin wanted a tragic one. Shostakovich however switched this. In the beginning of the war, when Russia was losing badly to the Germans, the composer presented his Seventh Symphony, a largely optimistic work. By 1943 when the tide had turned for the Red Army, Shostakovich was expected to deliver another triumphant symphony. But instead Russia received his Eighth Symphony, which was overwhelmingly somber. Neither the Eighth nor 1945's Ninth Symphony satisfied Stalin's desires for works celebrating the USSR's glorious victories in the war, and both were unofficially banned. Now that the war was over, the authorities once again reeled in Soviet artists via censorship. Shostakovich was quickly denounced as a formalist, and this made him extremely paranoid. He knew well Stalin's terror tactics, since many of his friends and colleagues had "disappeared" or been exiled to Siberia. The composer used to wait outside at night for his arrest, so that it would not disturb his family. But the arrest never came, and Shostakovich spent his time composing film music to keep him afloat financially. He also now worked on official propaganda music so that he could regain favor with the Communists. But his most important works from this period are the ones he wrote "for the desk drawer." These include a Violin Concerto and a song cycle From Jewish Folk Poetry. Stalin sent Shostakovich and other artists to New York City in 1949 as artistic representatives of the Soviet Union to the Cultural and Scientific Congress for World Peace. But the event was a humiliation for Shostakovich. He had to play the party puppet, and support only the party's official views. He even had to publicly denounce Stravinsky, a composer whose work he greatly admired. After Stalin's death in 1953, Shostakovich grew less afraid of political retribution. But he still joined the Communist party in 1960, so that he could become the General Secretary of the Composer's Union. Some say that Shostakovich was blackmailed into becoming the secretary, and the holding of this post made him despondent and suicidal. Also around this time his health began to deteriorate, and for the next 15 years he wrote very personal music, all of which ruminate darkly on themes of death, mortality, and art. The composer's last string quartet, The 15th String Quartet. The opening elegy from the selection above demonstrates the composer's preoccupation with morbid, and deeply personal themes. Shostakovich died from lung cancer in 1975, as one of the Soviet Union's greatest, and most repressed artists. Along with Piotr Ilyitch Tchaikovsky, the greatest Russian composer of the Nineteenth Century, Modest Petrovich Mussorgsky (March 9, 1839 – March 16, 1881) was born into a wealthy rural, landowning family. He began by picking out on the piano the tunes he heard from the serfs on his family’s estate. At the age of six, he began to study piano with his mother. I liked your blog, Take the time to visit the me and say that the change in design and meniu?